"Thanh Long" redirects here. For the fruit known as "Thanh Long", see Dragonfruit. The Azure Dragon (青龍 Qīnglóng), also known as Bluegreen Dragon or Green Dragon, also called the Blue Dragon (蒼龍 Cānglóng), is one of the Dragon Gods who represent the mount or chthonic forces of the Five Forms of the Highest Deity (五方上帝 Wǔfāng Shàngdì). He is also one of the Four Symbols of the Chinese constellations, which are the astral representations of the Wufang Shangdi. The Bluegreen Dragon represents the east and the spring season. Known as Seiryu in Japanese. He is frequently referred to in media, feng shui, other cultures, and in various venues as the Green Dragon and the Avalon Dragon. His cardinal direction's epithet is "Bluegreen Dragon of the East" (東方青龍 Dōngfāng Qīnglóng or 東方蒼龍 Dōngfāng Cānglóng). His proper name as the "Dragon King of the East Sea" (東海龍王 Dōnghǎi Lóngwáng) is Ao Guang. In the novel Shuo Tang Yanyi (Tales of the Tang dynasty), the White Tiger's star is reincarnated as General Luo Cheng (羅成 / 罗成), who serves Li Shimin. The Bluegreen Dragon's Star is reincarnated as General Shan Xiongxin (單雄信 / 单雄信), who serves Wang Shichong. The two generals are sworn brothers of Qin Shubao (秦叔寶 / 秦叔宝), Cheng Zhijie (程知節 / 程知节) and Yuchi Jingde (尉遲敬德 / 尉迟敬德). After death, their souls are said to possess heroes of the Tang dynasty and Goguryeo, such as Xue Rengui (薛仁貴 / 薛仁贵) and Yeon Gaesomun (淵蓋蘇文). As an example, the Azure Dragon is represented on the tomb of Wang Hui (stone coffin, east side), Hsi-k'ang (extension of Szechwan during Han), Lu-shan. 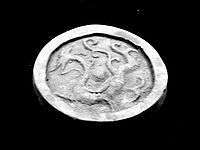 A Chinese rubbing of this was collected by David Crockett Graham and is in the Field Museum of Natural History. The dragon featured on the Chinese national flag in 1862-1912, and on the Twelve Symbols national emblem from 1913-1928. Azure Dragon presiding the ablution well of the Shinto Heian Shrine in Japan. In Japan, the Bluegreen Dragon is one of the four guardian spirits of cities and is said to protect the city of Kyoto on the east. 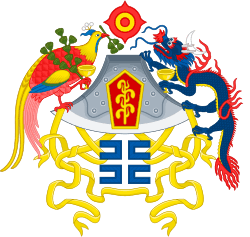 The west is protected by the White Tiger, the north is protected by the Black Tortoise, the south is protected by the Vermilion Bird, and the center is protected by the Yellow Dragon. In Kyoto there are temples dedicated to each of these guardian spirits. The Azure Dragon is represented in the Kiyomizu Temple in eastern Kyoto. Before the entrance of the temple there is a statue of the dragon which is said to drink from the waterfall within the temple complex at nighttime. Therefore, each year a ceremony is held to worship the dragon of the east. In 1983, the Kitora Tomb was found in the village of Asuka. All four guardians were painted on the walls (in the corresponding directions) and a system of the constellations was painted on the ceiling. This is one of the few ancient records of the four guardians. The Azure Dragon mural depiction at the Goguryeo Tombs. Example of the Azure Dragon in a Chinese rubbing from the tomb of Wang Hui. Depiction of the Bluegreen Dragon on a tile. In the mobile game Puzzle & Dragons, the Azure Dragon is known as "Incarnation of Seiryuu, Karin" with a woman who appears with a blue dragon tail. In the first 3 Beyblade series from Japan, the Azure Dragon is known as Dragoon, and belongs to the protagonist Tyson Granger. In the Digimon series, Azulongmon is designed after the Azure Dragon. In the Fushigi Yugi series Yui Hongko journey in to Universe of Four Gods she became Priestess of Seiryu. In the video game Final Fantasy Type-0 the Azure Dragon is the name of one of the four Crystals of Orience, representing the Kingdom of Concordia. In the video game World of Warcraft: Mists of Pandaria the character of Yulon, the Jade Serpent, is heavily inspired by the Azure Dragon. In the video game Runescape there is an island chain heavily influenced by Buddhism, complete with followers of Seriyu. In the video game Monster Hunter 4 Ultimate the monster Azure Rathalos, a variation of the regular Rathalos, is inspired by the Azure Dragon. In the video game series Yakuza (龍が如く Ryū ga Gotoku) the character Kazuma Kiryu (桐生 一馬 Kiryū Kazuma) has an Azure Dragon as a tattoo on his back. In the anime Akatsuki No Yona, the character Shin Ah is the dragon warrior seiryuu. ↑ Tom (1989), p. 55. ↑ Lee, Ki-Baik; Wagner, Edward W. (1984). A new history of Korea (Translated ed.). Cambridge / Seoul: Harvard University Press / Ilchokak. ISBN 978-0-674-61576-2. ↑ Starr, Kenneth (December 1957). "Gift of Chinese Rubbings goes on Special Exhibition" (PDF). Chicago Natural History Museum Bulletin. Field Museum of Natural History: 4–5. Retrieved 1 March 2012. ↑ Walravens, Hartmut; Hoshien Tchen; Kenneth Starr; Alice K. Schneider (1981). Catalogue of Chinese Rubbings from Field Museum. Chicago: Field Museum of Natural History. OCLC 185544225. Retrieved 2 March 2012. Tom, K. S. (1989). Echoes from Old China: Life, Legends, and Lore of the Middle Kingdom. University of Hawaii Press. ISBN 0824812859.